Received this a day or two ago. I know there are members here who are well informed about this watch, far more so than me, so I was hoping someone might tell me a bit more about the watch. As far as I can tell... its all original, untouched, and in very good order for a Bundeswehr issued watch. Roughly how old would this watch be? Does anyone know anything about this dial version (vs. the 3H version)? What a superb example. Pascal has one of these too. I know that some Heuer Bunds acquired new NSN numbers and had their old "3774" codes struck through because they were refurbished by Sinn (who replaced their tritium dials) but I'm not sure about these Orfinas. I'll see what I can find tonight. Thanks for posting this on NSN 6645 too. Can you post a caseback shot please? Thanks, Jon. Here's a shot of the caseback which is in remarkably good condition. I'm trying to build up my knowledge about this watch and issued military watches more generally, so any information at all would be great. He seems to have a couple of shots of Military Chrongraphs - both with 3H - and both in published books. So you may have a variant? Thanks. Yes, a good article that one. I noticed he uses his 'baseline' category to describe the "configuration found on the non-issued 'military' variants" while he uses the 'BUND' category to distinguish issued military pieces from civilian versions. He notes that "the BUND dial does not have any special dial printing beyond that found on the "baseline" configuration." The way I understand it, then, is the BUND doesn't have extra printing on the dial in addition to the civilian dial, but that doesn't seem to rule out the possibility there may have been BUND watches that don't have the (civilian) 'baseline' configuration. I notice that there seems to be two versions of the dial on the Tutima BUND also, and I have had some confirmation that one is not a later update/replacement dial but both types were in original issued watches. I am sure Pascal will be along in a moment, but his example is exactly like yours, genuine issued Bund without 3H, and no Porsche Design or PD on the dial. The article (which contains two of my photos of my watches, and several variants I supplied to him) is incomplete in that respect. Yours is the double-struck version (two NSNs or Versorgungsnummers), which as we discussed, were issued on the transition from the PD having its own number, to a new number being issued for all Bund 5100s, PD, Tutima, Arctos and Tengler. When these were issued, '82 onwards, all bore the same code. PD had a batch with the old number, and had to re-strike a new one on the casebacks (which is why they often do not align), prior to being able to alter their production engraving to suit the new number. So yours is real, genuine, early, and very cool. Well done. I have to confess that over the years I've grown a bit suspicious about many examples of what were supposed to be genuine issued PD. So if I may, I'll expand a bit on W.A. Manning's interesting article to share my personal thoughts on the subject. 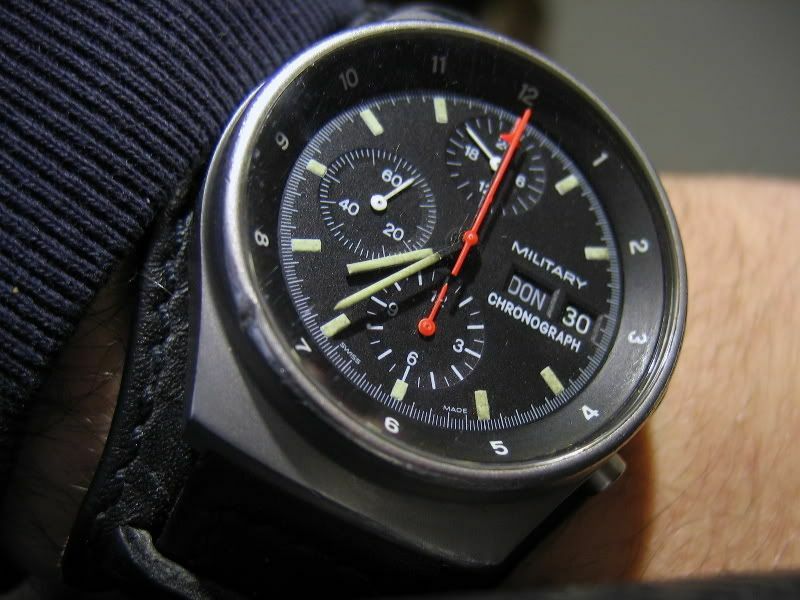 It is an established fact that the Bundeswehr aquired a large batch of these chronographs starting around 1979. Apparently, those watches were not only issued to pilots, but also to submarine officers and possibly other military units as well. Some were delivered with a plain dial showing only "Military Chronograph", and others had the "3H" to signal the use of tritium on the hands and indices. Most of these watches seem to have been delivered in a plain sand-blasted steel finish, but a few (probably depending on specific usage) were sporting a black PVD coating. Those are the real deal. I'll add to them the Venezuelan examples, which according to my research have been genuinely issued to Air Force pilots, but in very limited numbers. But I have no definite proof of that. NATO examples: I have the growing suspicion that those were made, and sold to the civilian market, as a result of some of the BUND watches finding their ways to the wrists of NATO pilots. I have yet to see convincing evidence that any real military contract was ever signed between NATO's command structure and Orfina. Swiss Air Force: a somewhat tricky topic. I have heard from many sources that some watches had been sold to the Swiss Air Force, but somehow I've never ever seen one with distinguishing military markings. Given the structure of the Swiss armed forces (conscription only), one might assume that the organized Swiss would know how to keep track of military issued equipment, and for that reason would assign clear references to each of its watches. So I am perfectly ready to be proven wrong here, but until then the Swiss issued watches will remain classified as civilian models. UAE Air Force: as far as I can tell, those watches were indeed commissioned by some people in the UAE, possibly even military personnel. But in the absence of any clear military markings, those were nothing more than a "Unit pride" watch, even if they may had possibly been ordered by the pilots themselves. US Air Force: same situation as the UAE chronos, as my take is that it was the pilots of one particular unit who ordered a batch of these watches for themselves, possibly after having seen those on the wrist of the German counterparts either during a deployment in Europe or during a military exercise such as the annual Red Flag. Pascal, thanks for this excellent and informative post. Its one of the great things about this forum to have such knowledgeable and willing members on hand. (1) the owner received his "issued" PD-Orfina from a family member (now retired or deceased) who was in the German Air force. (2) the watch was sourced, or serviced, or otherwise associated with a former Bundeswehr watchmaker. The increasing similarity of these separate sales pitches started to make me suspicious. In some cases the seller was probably sincere, but in other cases the story and the watch did not seem, to me, to add up. In one case I was offered a piece with the #7177 caseback. The seller insisted (and was, in the end, offended by my circumspection) that this was indeed a genuine BUND version, but that the caseback had been replaced in a recent service. ( ) The main plank of his story rested on the idea that the watch was originally owned by a German fighter pilot (although the seller could not demonstrate anything beyond this). So your suspicion is something which seems borne out in my experience, and in the very least I would say that you need to ask a truck load of questions about any BUND issued watches before buying. In particular, pay attention to the seller's story as much (if not more so) than any pictures they have. I'm not sure to what extent there is any 'mixing and matching' going on currently to put together genuine issued BUND Orfina Porsche Design watches (my guess is some, but probably nothing like happens with Rolex or Breitling) but one needs only to look at the, frankly, ridiculous prices currently being asked for these (particularly for non-issued versions) to know you should be cautious. Thanks again, Pascal (and all others) for you comments. Nothing to contribute except to say thanks for the information all of you - this was a bit of a grey area for me but I've come out of it much better informed - thanks.